Have you and your family picked a pumpkin to carve for Halloween night? Maybe you’re planning to carve a scary face so the trick-or-treaters who visit your house will be spooked. 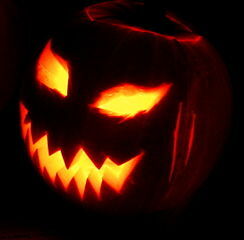 Although pumpkins are a central part of Halloween celebrations in America, the first Jack O’Lantern was not a pumpkin. According to Irish legend, a mean drunk known as Stingy Jack was always playing tricks on his neighbors and family members. One day, he tricked the Devil into climbing a tree to pick fruit. While the Devil was in the tree, Jack carved a cross into the tree’s trunk. This prevented the Devil from climbing back down. While the Devil was stuck in the tree, Jack made him promise not to take Jack’s soul. The Devil promised and Jack helped him get down. To ward off evil spirits and keep Jack away, people in Ireland hollowed out turnips, gourds, potatoes and beets and placed a candle in them on All Hallows Eve. When Irish immigrants came to America, they brought the tradition of the Jack O’Lantern with them. They discovered that the pumpkin, which is native to America, was much easier to carve out than a turnip or potato. As a result, pumpkins began to be used as Jack O’Lanterns.